Folliculitis et perifolliculitis capitis abscedens et suffodiens is a rare disease of unknown etiology. It is a suppurative process that involves the scalp, eventually resulting in extensive scarring and irreversible alopecia. The condition is also known as 'acne necrotica miliaris' or 'Proprionibacterium' folliculitis. Most often the disease affects men of African-American or African-Caribbean descent between 20 and 40 years of age. The clinical picture is determined by fluctuating painful fistule-forming conglomerates of abscesses in the region of the occipital scalp. The cause of scalp folliculitis is not well understood. It is generally considered to be an inflammatory reaction to components of the hair follicle, particularly the micro-organisms. These include: bacteria (especially Propionibacterium acnes, but in severe cases, also Staphylococcus aureus), Yeasts (Malassezia species) and mites (Demodex folliculorum). The initial histopathologic finding is an exclusively neutrophilic infiltration followed by a granulomatous infiltrate. The treatment of the disease is usually difficult and often disappointing. Successful treatment with isotretinoin 1 mg/kg body mass could be achieved only after regular systematic administration in the course of 3-4 months. Here we describe a patient with eruptive purulent form of the disease, which has been controlled with combination therapy: systemic antibiosis with metronidazole and clindamycin, dermatosurgical removal of single nodular formations, and isotretinoin 1 mg/kg body mass for 3-5 months. The main reason is considered to be the disordered keratinization and further occlusion and accumulation of keratin at the hair follicle. 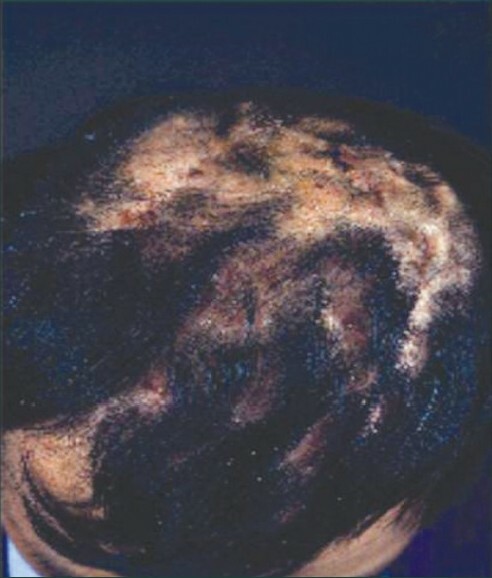 After a dilatation followed by rupture, not only a granulomatous inflammatory process accompanied by the attraction of gigantic cells, partially phagocyting the keratin masses are induced in the hair follicle, but also an inflammatory bacterial process derived from a superinfection, most frequently caused by Staphylococcus aureus and Staphylococcus epidermidis, which are considered to be the main factors in the chemotaxis of neutrophils. 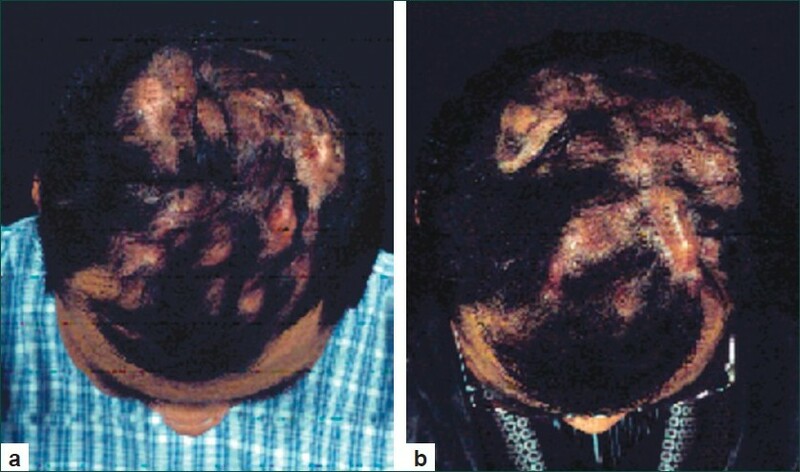 After an adequate therapy is given, an irreversible alopecia remains, due to the disordered structure of the hair follicle by the infiltration of neutrophils and giant inflammatory cells. Consequently, regular examinations of the patient are recommended, including the dermatologic and general status, blood picture, histologic and sometimes immunohistologic analyses. This case concerns the patient P.G., 30 years of age, nonsmoker, who passed through the polyclinic. His complaints had begun 7 months earlier, when lesions that were painful and fluctuating between each other had appeared in the subcutaneous zone of the occipital skull area. The patient reported that he was also losing his hair at the places, where the nodules appeared. The ambulatory biopsy showed destructing granulation and abscessing inflammation with partially perifollicular nature. The ambulatorily applied therapy by cefuroxime and metronidazole gave no therapeutic results. In the occipitoparietal and also in the parietal area, nodular confluent conglomerated with exophytic growth trending to form fistula were found [Figure 1]a. The conglomerates were not stuck to the aponeurosis and, if pressed, a purulent secretion was spread, not only from the close vicinity to the pressed area, but also from distant areas, which clearly proved the presence of fistulae and sinuses, communicating between each other. Hairless areas were noticed at the sectors of the head affected by the nodules. Exaggerated and painful lymphatic nodes supraclavicularly, left, were found. The patient's general status was good. The biochemical tests held and the peripheral blood picture showed quite normal results, except for the neutrophils (76.6%) and lymphocytes (13.5%). The macrobiological smear after contests on the nodular formation parietally and aspiration of secretion showed a minimal growth of Candida albicans and S. aureus; hair culture: minimal growth of C. albicans. Echography of the occipitoparietal and parietal skull part in the zone of the affected areas: Multiple capsulated structures showing no echogenicity, possible presence of cystic formations. Cutaneous and subcutaneous pseudocystic sectors or abscesses were bilaterally and parietally detected in magnetic resonance tomography of the head. Reactive raise and dissemination of tabula externa, parietally, right. Due to the presence of a minimal perilesional edema, significant abscessing was not very probable. Superinfection of single nodular components was not excludable. Dermis with hair follicles and dilated vessels were seen on the foreground. A dense, mixed inflammatory infiltrate consisting of lymphocytes, plasmacellular infiltrates, neutrophils, and single macrophages was found. Epidermal edema: Multiple giant cells arranged side by side, follicular and perifollicular mixed inflammatory infiltrates. No cystic wall was present. Granulomatous dermatitis with mixed inflammatory infiltrate. Systemic therapy by metronidazole 400 mg twice a day in combination with clindamycin, 600 mg 3 times daily, intravenously, for 2 weeks was applied [Figure 1]b. Partial incision of nodular lesions from the occipital and occipitoparietal vertex area was performed. A tangential removal of the superior dermal and epidermal part, also of the pseudocystic-structured nodular formation and removal of the pseudocystic content by simple abrasion with scalpel were made. The defect was covered by a skin sector fixed by a primary stitching. Centesis and evacuation of significant quantities of dense secretion and taking of microbiological smears was done. After that a systemic treatment by isotretinoin 1 mg/kg of body weight, per os, was applied. The treatment continued for 3.5 months and a significant improvement of the clinical findings was noticed. Initially we thought that the patient was suffering from Acne nodulocystica, because of the anamnesis revealing serious acne in the past, as well as because the nodular, fistula-making nature of the lesions. The microscopic analysis showed perifollicular hyperkeratosis, accumulation of keratotic materials in the ostium of the follicles, strongly expressed neutrophilic infiltrate combined with macrophages, giant cells, histiocytes, and lymphocytes in the area of the papillary and reticular dermal layer of the skin. The histologic diagnosis was: "Granulomatous dermatitis with mixed inflammatory infiltrate." No cystic formations could be evaluated by magnetic resonance tomography of the head and histopathologically. The untypical manifestation of tinea capitis has been excluded by microbiological and histologic examination for fungal infection. Due to the resistance of the nodules and their difficult susceptibility to the aforesaid therapy (dermatosurgical approach and systemic antibiotic treatment), a systematic treatment by isotretinoin 1 mg/kg of body weight, per os, was applied. After this treatment, which continued for 3.5 months, and further reduction of the dose to 0.5 mg/kg of body weight because of the appearance of epistaxis and dryness in the ocular and buccal mucosae, a significant improvement of the clinical findings was noticed [Figure 2]. In the case of our patient, the antibiotic therapy that was initially given in combination with local disinfectants for 2 weeks, did not lead to the desirable results. The complete surgical removal of the nodules was not possible. The next systemic therapy using isotretinoin for 3-4 months gave good results. Folliculitis et perifolliculitis capitis abscendens et suffoidens is difficult to treat, and its early diagnostics and its systemic treatment by isotretinoin lead to significant improvement of the clinical picture due to the reduction in the nodule growth. Because of the existent possibility for malignant transformation, long observation and, if necessary, controlling histologic analysis are recommended. 1. Spritzer L. Dermatitis follicularis et perifollicularis conglobata. Dermatol Zeitschrift 1903;10:109-20. 2. Hoffmann E. Folliculitis et perifolliculitis capitis abscedens et suffodiens: case presentation. Dermatol Zeitschrift 1908;15:122-3. 3. Luderschmidt C, Klövekorn W. Systemic inflammatory reactions and extracutaneous manifestations of Acne vulgaris. Z Hautkr 1986;61:617-21. 4. Curry SS, Gaither DH, King LE Jr. Squamous cell carcinoma arising in dissecting perifolliculitis of the scalp. A case report and review of secondary squamous cell carcinomas. J Am Acad Dermatol 1981;4:673-8. 5. Gilliam AC, Lessin SR, Wilson DM, Salhany KE. Folliculotropic mycosis fungoides with large-cell transformation presenting as dissecting cellulitis of the scalp. J Cutan Pathol 1997;24:169-75. 6. Moyer DG, Williams RM. Perifolliculitis capitis abscedens et suffodiens. A report of six cases. Arch Dermatol 1962;85:378-84. 7. Shaffer N, Billick RC, Srolovitz H. Perifolliculitis capitis abscedens et suffodiens. Resolution with combination therapy. Arch Dermatol 1992;128:1329-31. 8. Berne B, Venge P, Ohman S. Perifolliculitis capitis abscedens et suffodiens (Hoffman). Complete healing associated with oral zinc therapy. Arch Dermatol 1985;121:1028-30. 9. Dubost-Brama A, Delaporte E, Alfandari S, Piette F, Bergoend H. Perifolliculitis capitis abscedens and suffidiens. Efficacy of isotretinoin. Ann Dermatol Venereol 1994;121:328-30. 10. Georgala S, Korfitis C, Ioannidou D, Alestas T, Kylafis G, Georgala C. Dissecting cellulitis of the scalp treated with rifampicin and isotretinoin: case reports. Cutis 2008;82:195-8. 11. Ljubojevic S, Pasic A, Lipozencic J, Skerlev M. Perifolliculitis capitis abscedens et suffodiens. J Eur Acad Dermatol Venereol 2005;19:719-21. 12. McMullan FH, Zeligman I. Perifolliculitis capitis abscedens et suffodiens; its successful treatment with x-ray epilation. AMA Arch Derm 1956;73:256-63. 13. Glass LF, Berman B, Laub D. Treatment of perifolliculitis capitis abscedens et suffodiens with the carbon dioxide laser. J Dermatol Surg Oncol 1989;15:673-6. 14. Varshney N, Al Hammadi A, Sam H, Watters AK. Perifolliculitis capitis abscedens et suffodiens in an 18-year-old Aboriginal Canadian patient: case report and review of the literature. J Cutan Med Surg 2007;11:35-9. Authors of Document Agrawal, P.G., Khopkar, U.S., Mahajan, S.A., Mishra, S.N.